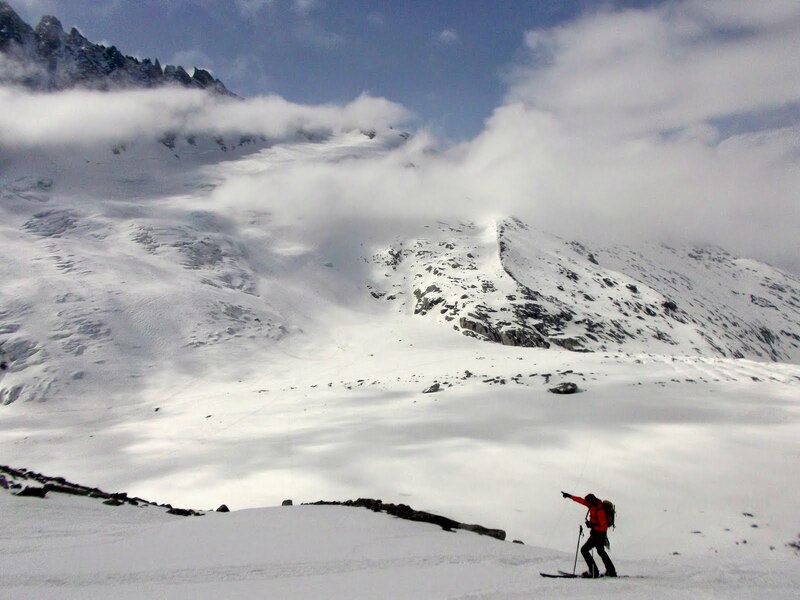 Back on the boards--skiing down the Vallee Blanche in Chamonix. Skiing set my first roots in the outdoor world. Middle-through-high school Saturdays I'd wake at an ungodly hour for the ski bus trek across Puget Sound to the Cascades. Later, as my ski buddies and I progressed, we'd sometimes tackle a bit of our “backyard backcountry” on the Olympic Peninsula's Hurricane Ridge. Notching things up for an overnight tour, we had a forced shiver-bivvy on the Mt. Tahoma Ski Trail when the hut we'd planned to stay at was either a lot longer away than we thought or we were lost. In the morning we followed our tracks back to the car, with our tails between our ski boots. I learned a lot through skiing. Perhaps most importantly: I learned that the outdoors called to me. I learned and that it was possible to have fun in a challenging environment if you're properly prepared with the right equipment. And I learned that knowledge is the most vital piece of equipment. But then I went away to college in Virginia. Though we did take a winter weekend ski trip to West Virginia, by that point I'd discovered climbing and after checking out the inclined ice rink that they called a ski slope, I figured it was time to grow where I was planted. My climbing took off and my skis stayed under the dorm-room bed. 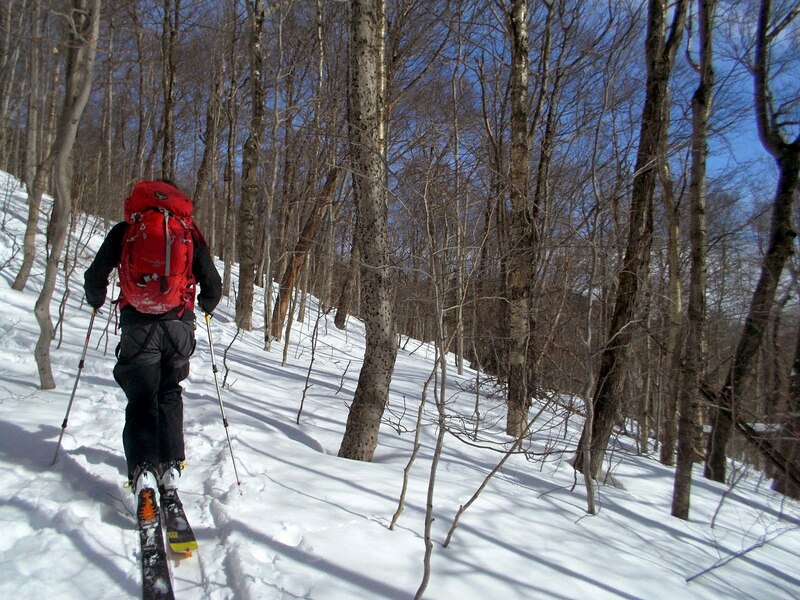 Alps prep--skinning the glades up near Big Jay in Vermont. Years later, I'm back to the boards. I've been living in Vermont now for a decade, focused mainly on rock, ice, and alpine, but the siren song of snow began calling again this year as the shriveled autumn leaves rustled in the wind. I ordered up a new set of boots, skis, and skins in November and waited for the flakes to fly. And waited. The kindest thing I can say about the early-season skiing in the Northeast this year is that it made me happy to be an ice climber. Not to be deterred by the anemic start, I made plans for an April ski trip in the Alps and hoped that I'd have the time and conditions to train. In the meantime, I kept up a regimen of leg lunges at the climbing gym. Finally though, March came in like a lion, dumping snow in abundance, and that lion stuck around. I rode the back of that cat, checking out some backcountry terrain I already knew and exploring new-to-me lines around Jay Peak, Camel's Hump, and Smugglers Notch. By the time the plane took off April 3rd, I felt ready—that is, until my first day in the Alps. 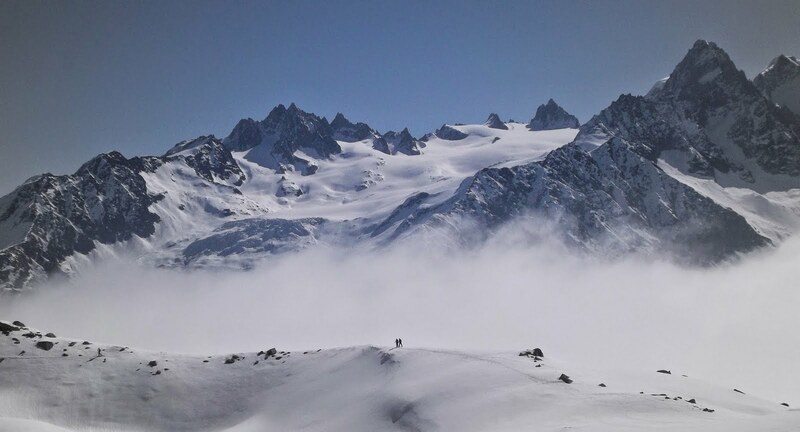 Skipping past the ski area boundary and getting set to descend through a milk bowl fog onto the Argentiere Glacier, I wondered how truly ready I was. Pulling my Ultimate Hoody over my Alpine Rider helmet, I took the plunge. The choppy, half-frozen snow chattered against my skis and every now and then the fog would thin to reveal looming seracs and toothy crevasses nearby. While I'm well-familiar with such things in the alpine world, to experience them on skis was to feel again like a beginner. For starters, in the alpine world, the team is typically tied in, not rocketing down glacial terrain unroped, and we've got ten sharp points to hold us to the slope, not the thin edge of a ski. And, were that then edge to lose purchase, I was highly suspect that the sharp point of a ski pole would be anywhere near as effective in arresting a fall as an ice ax. Finally we can see our goal--Col du Chardonnet lies ahead! While it felt daunting, it also felt good—as a climbing guide, I've seen the growth that taking on new challenges can provide and I've sought to keep that vibrant in my own personal climbing. And as an instructor, I know the value in always revisiting the role of the learner. Climbing up the far side of the glacier, toward our objective—Col du Chardonnet—I was able to transfer pieces of what I knew from the alpine world to this world of skis: as the terrain gets steeper and icier, it becomes ever the more vital to keep weight over your feet, resisting the urge to cling to the slope or lean too far forward of your feet. 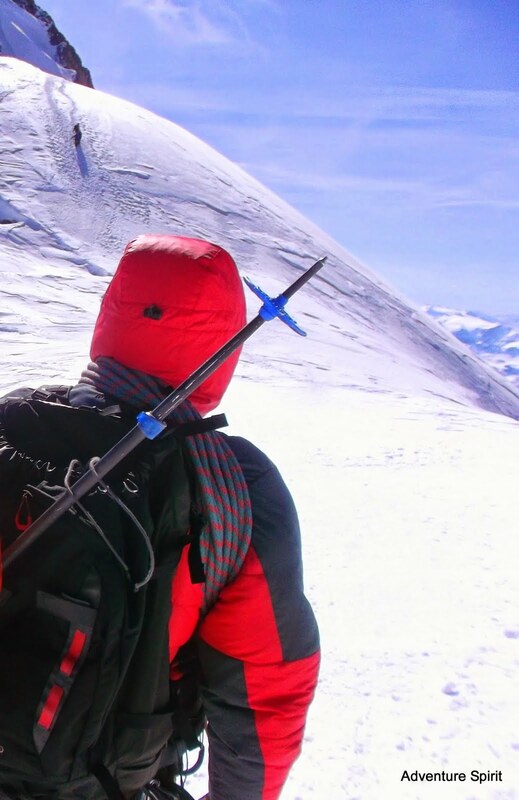 But of course, it's not always a direct translation either: cramponing with skis involves keeping a stiff angle to drive the uphill blade into the snow, whereas in alpine cramponing it's important to flex ankles and contact all the spikes. By the time we reached the top of the Col, ripped skins, and readied to descend, the fog had cleared, my confidence had risen, and I got my first taste of the distinct advantage that skis offer in alpine terrain. In seconds we schussed down slopes that had taken hours to ascend, cutting through the now-thawed and velvety top sheet of snow, taking in astounding new views with each turn. All too soon, we were back in the valley, where it was already spring. Two from our crew emerge from the fog as we ascend to Col du Beugeant. Col du Beugeant was our next tour, a moderate ski ascent, followed by some rock scrambling, a rappel, and then miles of valley skiing on the backside of the Aiguille Rouge, the neighboring range to the Mont Blanc Massif. Sometimes when you're in the thick of a range, it's hard to get the scale of it's majesty; as the morning fog burned off the Aiguille Rouge it revealed both the beauty of it's own rocky crags and the stunning shoulders of the Mont Blanc Massif across the valley. 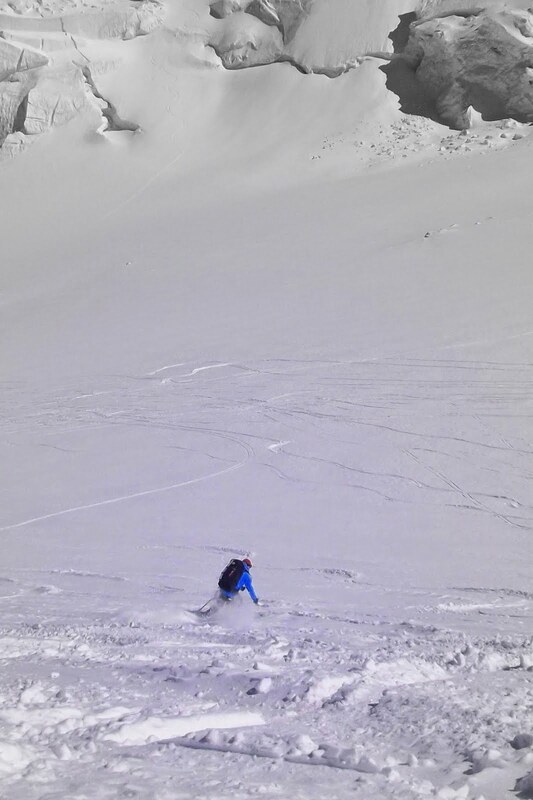 Our gaggle of friends, guide aspirants, and Chamonix locals, made tracks for the Col as the snow softened the south aspects. A pretty steep skin track had been set toward the Col and as the rays intensified, I was happy to have on my MTR 171; it's my first season using the VENTech fabric and it's cooling abilities are astounding. On the flip side, after we scrambled up into the winds of the Col and began to rap the shadowy north side, I was happy to have it's powerful wicking keeping the that sweat from chilling me. After some scratchy hardpack sliding through a rocky pinch-point I realized I was at the end of the rap line. Looking down, I gulped—I could have used a few more meters of rope security, but it was time to take the plunge. Rapping onto the icy north side of Col du Beugeant. Following a couple of desperate kick turns I broke out into the sunlight and softer snow. The rest of the descent was pure heaven, and sipping cold “1664” brew on the patio of an ancient inn at the bottom of the Buet valley, it did occur to me that —much as I love ice climbing—the days seldom end with this kind of comfort and conviviality. 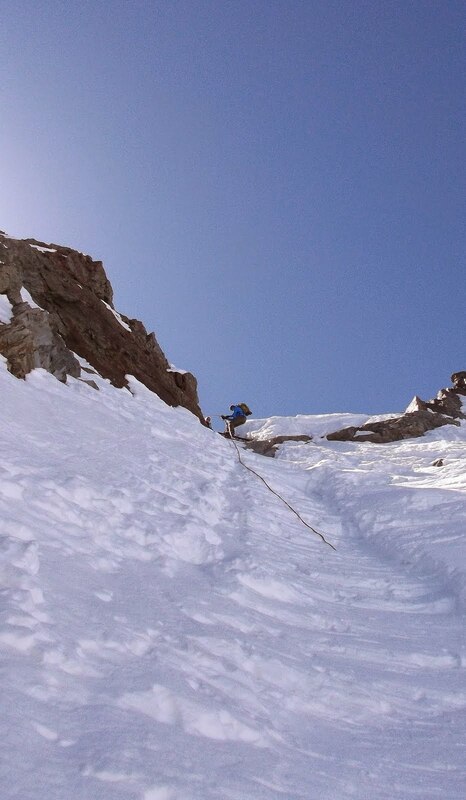 The reward--ice climbing could learn a thing or two from ski mountaineering. 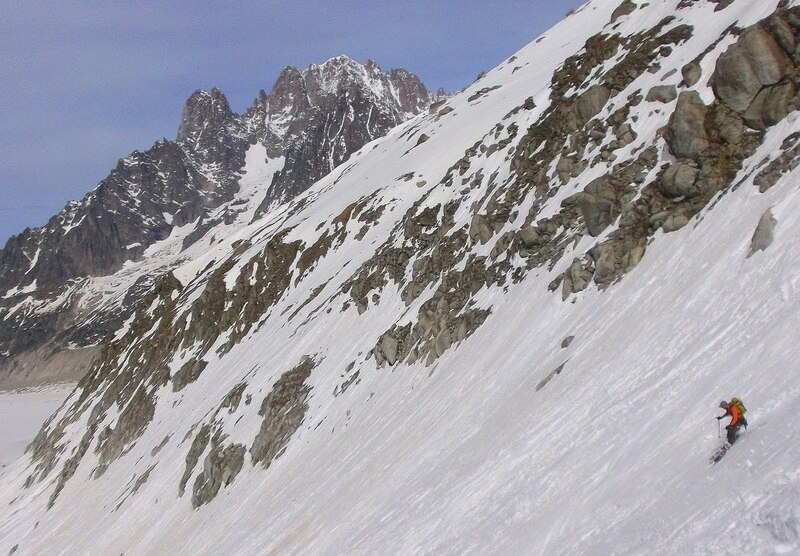 The “Vallee Blanche” is Chamonix's classic off-piste tour. Beginning with a 15-minute, 9000' cable-car trip to the launch point high on the Aiguille du Midi, it's a popular shake-down for Haute Route tours, so not surprisingly it was a bit of a mountain-guides' reunion atop the tram station, as I ran in to a bundle of different Northeastern and Northwestern guides getting their groups set for the Haute Route. So far from home, yet in the company of so many friends! 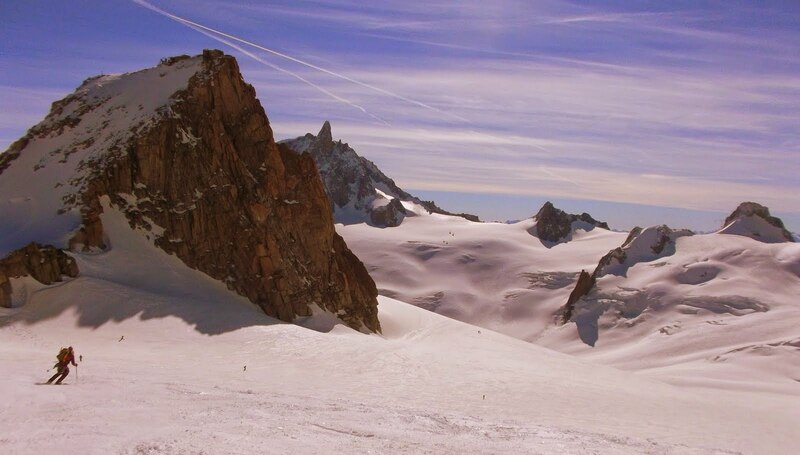 We had to keep conversation brief however; though it only takes a few hours to ski the Vallee Blanche, our crew had decided to add in a trip up to Aiguille du Tacul. Making tracks toward Aiguille du Tacul. Around midday we reached the top amidst softening snow, making for a delightful descent down the steeps of the the Col du Tacul and onto the expansive Mer de Glace (“Sea of Ice”) glacier. Years ago, I descended this same path on foot, coming down from the Midi-Plan Traverse alpine climb. It took hours, zig-zagging between snow bridges sagging in the summer heat and stumbling over gravelly moraine tailings. Now, I rocketed along on a straight line toward the Montenvers railway station, my skis providing ample bridging across the crevasses still buried deep in spring snow. Those years ago, I arrived at the station hours after the last train had left from Montenvers down to Chamonix Valley and had to walk down the tracks in stiff boots. 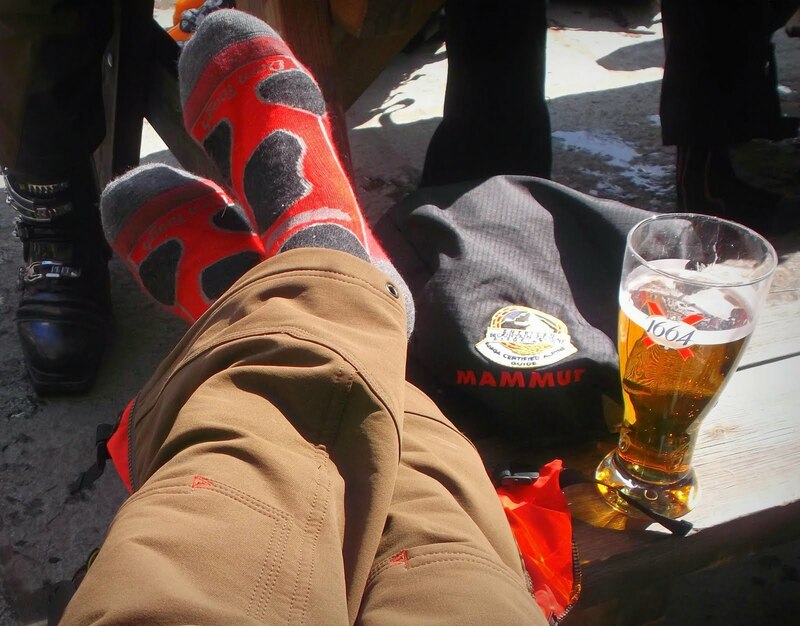 Now, we made it to the train station with time to enjoy a leisurely beer and a view of our day's path far up the glacial valley—I was beginning to see the advantages of adding skis to the alpine kit! Enjoying a quick descent from the Aiguille du Tacul. A well-timed rain day provided a chance to rest the legs and wander around Chamonix and prep for the next day's ski/climb of Mont Blanc via the North Ridge of the Dome du Gouter. Drizzle dripped off my Masao jacket as I stocked up on cheese, bread, chocolate, and all the other French delights, wondering if all the shopping would be for naught. Fortunately, the next morning dawned as imperially blue as that jacket and I put it away for the last time on this trip. In the alpine world, punchy snow means post-holing hell, so that's often the argument for an early start. Skiing favors a soft edge, so we left town leisurely and disembarked from the tram on the Plan du Midi as the sun began to crest the Mont Blanc Massif. Things were still a bit icy for my taste and I felt the anxiety of the beginner as I learned to trust in my ski crampons as I traversed a series of bowls with unsavory run-outs. While I was learning to trust the holding power of ski crampons, the idea of a slide without an ice ax at the ready was still a disconcerting thought. Fortunately, we made it to the Grand Mullet Hut without incident, and after a hearty supper we settled down for an early sleep. Sleep didn't last long though, as we roused at 1:30am for coffee, toast, and the summit climb. Skinning in the dark up increasingly steep and icy slopes, my skis skittered around and my awkward kick turns held consequences that made me queasy to consider. When we hit the ice pitches and the rope came out, crampons went on our boots, and skis went on our backs, I felt comforted again—not so much for the security the rope and 'pons provided, but for being back in an activity I more clearly knew: Alpine climbing. Even though there were still risks and consequences, I felt I understood the contract better. 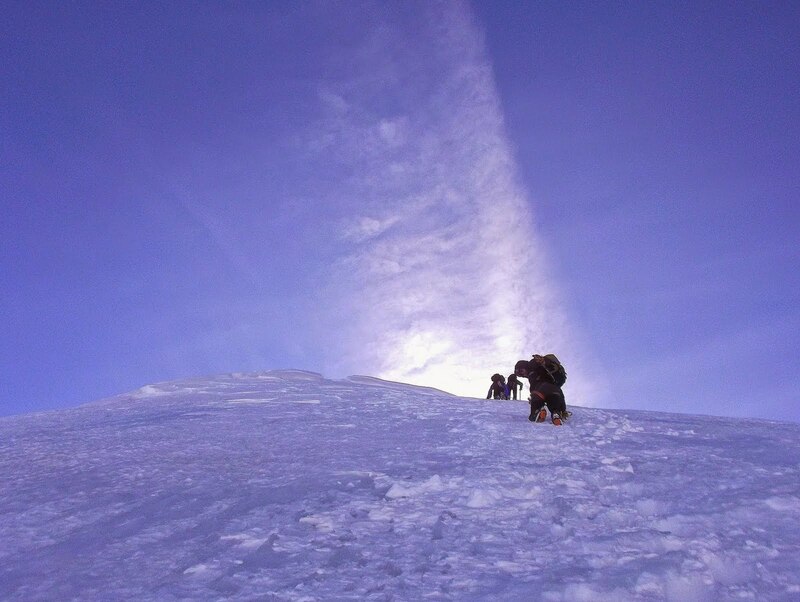 This intermingling of known and unknown continued for the remainder of the ascent, as we transitioned between crampon and ski climbing en route to a pit stop at the Vallot Bivouac, an emergency shelter high on the flanks of Mont Blanc. One thing I remember about skiing as a kid is that it can be a dangerous thing to go into the lodge at lunchtime: suddenly you imagine the weather that felt so comfortable when you were just out in it becomes more daunting viewed through the window. It wasn't just our imagination acting up as we exited the Vallot confines though: a steady lenticular cloud capped Mont Blanc and a jet stream of snow shot from the approach ridge. Still, now back in alpine climbing mode, I was in my comfort zone—I figured we could check it out and turn tail as need be—and all the time we did that the icy slopes below would be softening for our skis. Win-win. We continued up. Back in the alpine style on the final crest of Mont Blanc. Toward the top of Europe. Donning my Ambler puffy, happy with its high collar and ample hood since my face mask was buried somewhere in my pack, I hoisted my Trion Guide and we set out in my full alpine armor. There were a few lulls in the battle as we alternated between windward and leeward on the ridge and—miraculously—the higher we climbed the more the lenticular melted away, until we were standing on top for a brief but memorable panorama down onto Italy, France, and Switzerland. In all the years I've alpine climbed around Chamonix I'd always considered climbing Mont Blanc for this view into three nations, but I couldn't stomach the thought of the summertime slog it involved. Standing on the summit and feeling the joy, I remembered the mountaineering mantra that “the summit is only halftime,” but I was comforted by the fact that with a ski descent it would be a quick second half. We down climbed to the Vallot Bivouac, donned our skis and began the victory lap, descending 12,000' of butter turns down into the warm valley. Fitting for an alpine climber, the last 500' or so were thawed to the point that we needed to boot it down the trail—a reminder of how difficult a descent it would be sans skis. Enjoying--thoroughly--the 12,000' of descent from Mont Blanc's summit. 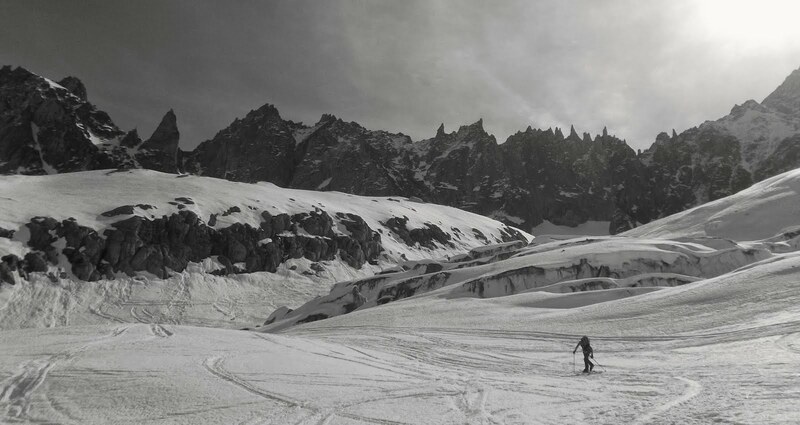 From the first hesitant turns down to the Argentiere Glacier to the ski descent of Mont Blanc the past ten days had been an incredible arc of learning. Building on my roots as a skier in the Pacific Northwest and adding in a big dose of alpinism from around the world, I've now melded both my childhood and adult paths into the realm of ski mountaineering. I'm enjoying the “knowns” my alpine experiences have brought into it (the importance of efficient transitions, terrain familiarity, and so on), but also appreciating being startled when learning doesn't transfer so directly (wait, you mean in skiing you rest on the uphill leg?). It's lending me a fresh perspective on mountains and on learning in the mountains. I'm loving what its adding to my personal climbing and professional guiding repertoire, melding my first outdoor love with a two-decade relationship with climbing and creating something new. While I'm looking forward to the summer season ahead, I know that when the cool autumn winds blow, I'll be ready for the flakes to fly and this learning to begin anew.